2. Typical cone shape assure direct contact between material and heated surface area so that heat is transferred rapidly by conduction. Through blending,uniform contact of temperature to the product will reduce the drying time and it will reduce the internal pressure. 3. As a result of maintaining high vacuum permits to draw the moisture fastly and the entire batch brings every particle in vacuum operation because of rotating motion. 4. The dryer is easily cleanable for minimum process delay during change of batch. 5. Double cone vacuum dryer is fitted with additional accessories such as condenser , Receiver and Cyclone separator. 6. 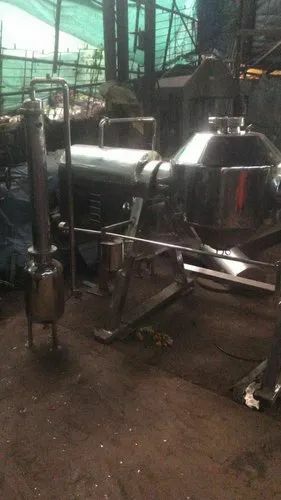 Cyclone Separator is used for separating the dried powder, which is passing through the vacuum. 7. Vapour generated from the cyclone is passed through the condenser where there is a change in a state from vapor to liquid. 9. The liquid from the condenser is passed into the receiver from where it is collected for further process. Please the have look on the above features and see if we can use this technology. This 100 Liters mixer is available in stock with us and can be dispatch immediately. Established in the year 1999, we,“Traxit Engineers Pvt. Ltd.”, are among the recognized business entity involved in the process of manufacturing, exporting and supplying wide range of Rubber Cutter Dissolver, Continuous Kneader, V Blender & many more. These are made utilizing modern machinery and latest technology as per the international quality standards and guidelines. As per the policy of the company, we give top priority to the quality of the products manufactured by us. The products offered by us are manufactured using optimum quality raw material sourced from reputed vendors of the market. With the help of expertise, personnel appointed by us are able to establish our organization in the upcoming markets. All our products have made a distinct place in the market owing to their features like superb performance, quality, longer life span and economical prices. Our exporting countries are Germany, USA, Japan, China.